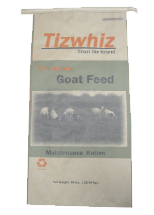 Premium feed for growing, developing and showing goats. 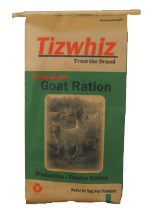 Feed 2 lbs of Show Goat per head per day with a minimum of 1 lb good quality hay. Caution: Use only as directed. For goats only. Feed pellets free choice after weaning with good quality hay. Feed pellets free-choice after weaning with good quality hay. Always provide access to plenty of fresh, clean water. Store feed in cool, dry place. Corn, Oats, Soybean Meal, Wheat Middlings, Molasses, Soy Oil, Calcium Carbonate, Dehydrated Alfalfa Meal, Dicalcium Phosphate, Distillers Grains Dried w/ Solubles, Salt, Potassium Chloride, Magnesium Oxide, Lignin Sulfonate, Vitamin A Supplement, Vitamin E Supplement, Vitamin D-3 Supplement, Biotin Supplement, Folic Acid, Vitamin B-12 Supplement, Calcium Pantothenate, Niacin, Thiamine Mononitrate, Menadione Dimethylpyrimidinol Bisulfite (Source of Vitamin K Activity), Riboflavin, Pyridoxine Hydrochloride, Zinc Sulfate, Choline Chloride, Ferrous Sulfate, Manganese Sulfate,Ethylenediamine Dihydriodide, Cobalt Sulfate, Sodium Molybdate, and Sodium Selenite. Always provide access to plenty of fresh, clean water. Store feed in cool, dry place.